Driving down through the beautiful Florida Keys from Miami to Key West is a classic American road trip. Here’s what you can expect on the journey, plus my favorite things to do! Key West is the Southernmost city in the United States, just a 4-hour drive from Miami on the scenic coastal Overseas Highway with plenty of interesting (and kitschy) things to do during the 110-mile trip, including crossing 42 different bridges. No visit to South Florida is complete without road tripping down to the Conch Republic for a few days. Especially if you like pirates, key lime pie, water-sports, and live music! I spent 4 days exploring the Florida Keys with my friends Steph & Lauren. These were our favorite things to do while driving from Miami to Key West! The only way to experience the scenic Florida Keys is behind the wheel of a convertible Jeep Wrangler like the one we rented from Tons Of Fun Tours in Miami. Drop the top, and enjoy a beautiful coastal drive down to Key West! To start our adventure, we slowly made our way to Marathon Key under the warm sun with the soft-top down. Stopping for photos and quirky souvenirs, like a stuffed shark who would become our mascot for the rest of our Key West road trip! Another option is Discover Car Hire. They search all the big car rental companies and find the best price. Dangling my arm over the water, a massive sea creature suddenly leaped out and wrapped its mouth around my hand to the horror of screaming onlookers. 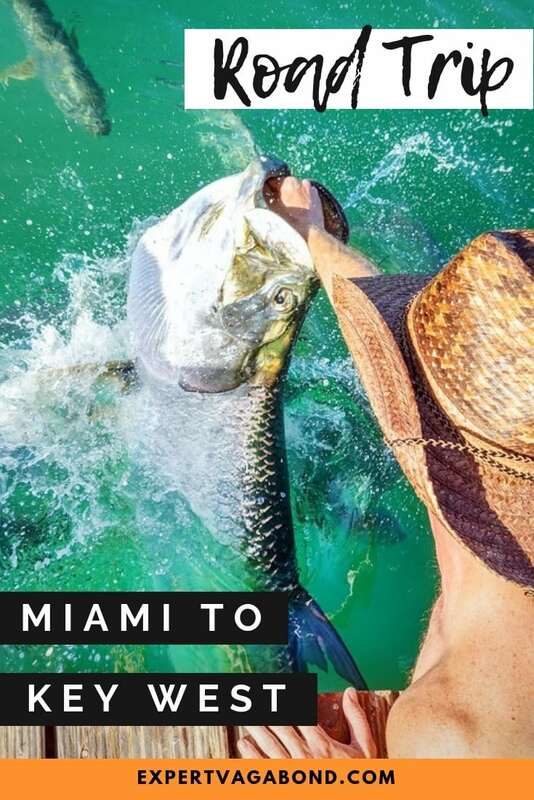 Growing up to 8 feet long and weighing over 200 pounds, the Tarpon is a huge game fish that live in the tropical waters off the Florida Keys. Fishermen from around the world travel here just for a chance to catch (and release) one of these monsters. However, you can also buy a bucket of bait and hand-feed these giant fish from the docks of Robbie’s Restaurant on Islamorada. Be careful, they have small teeth that will leave marks! It’s a must-do experience for any road trip from Miami down to Key West. 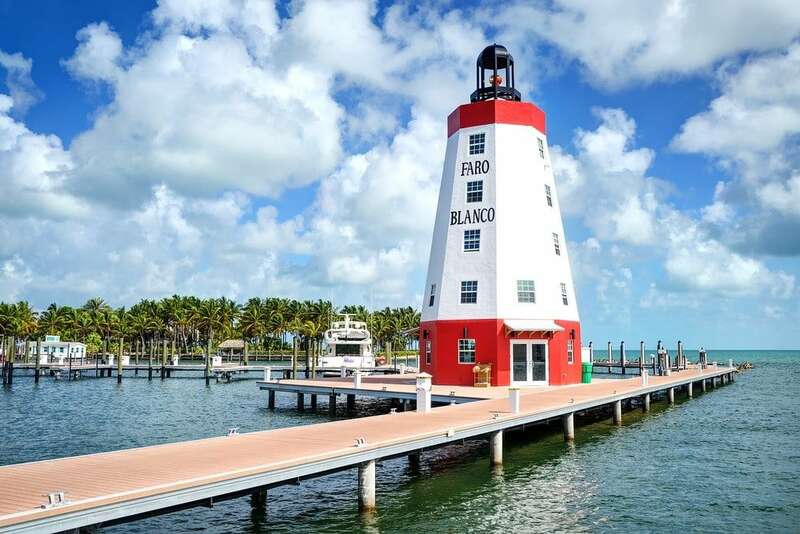 While you could drive directly from Miami to Key West in about 4 hours, there’s a lot of cool stuff to see around the rest of the Florida Keys too. I recommend driving down over the course of 2 days, spending a night in Marathon before continuing on to Key West. That’s exactly what we did, booking a room at the beautiful Faro Blanco Resort to break up the drive. 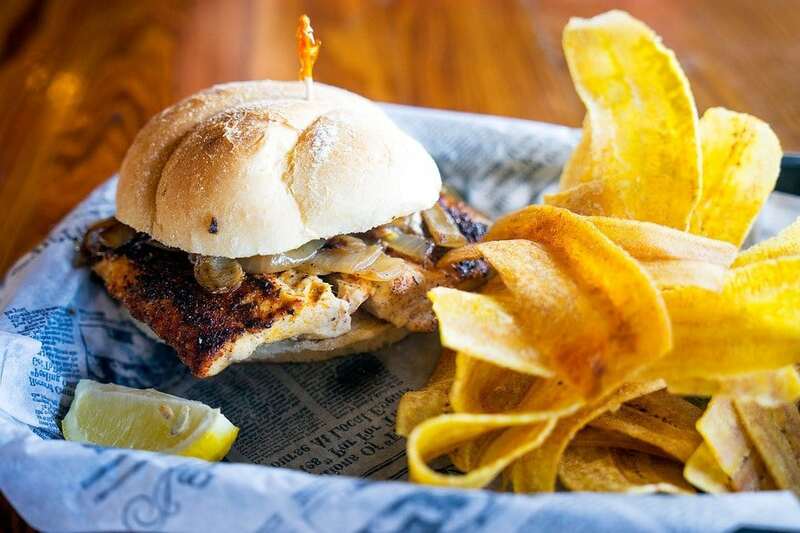 While in Marathon, make sure to grab some lunch at Tarpon Creek Bar & Grill and dinner at the Lighthouse Grill. Both serve up all kinds of tasty fresh fish caught locally. 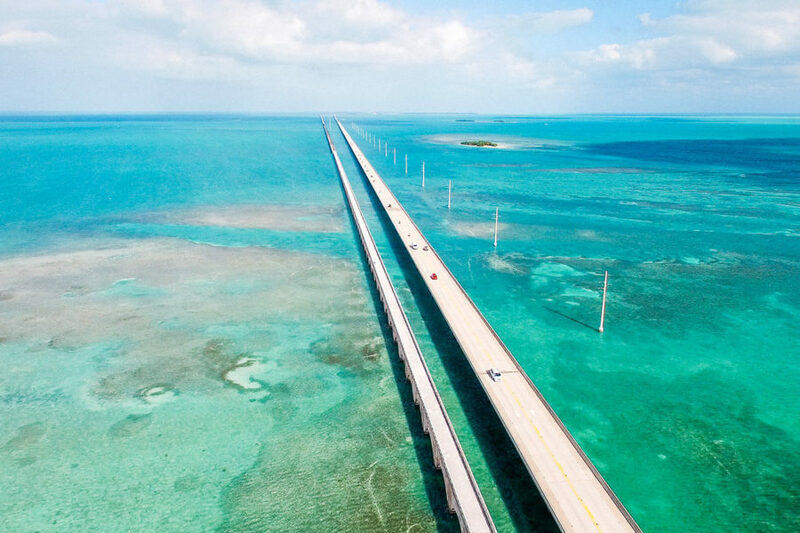 Driving over the vibrant blue ocean for miles on a bridge that never seems to end was one of my favorite parts of road tripping the Florida Keys. 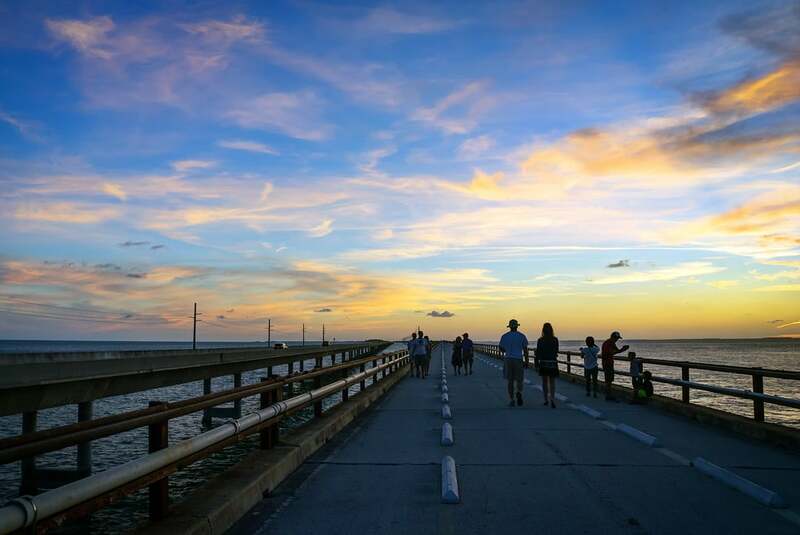 The Seven Mile Bridge was originally constructed in 1912 for railroad traffic. 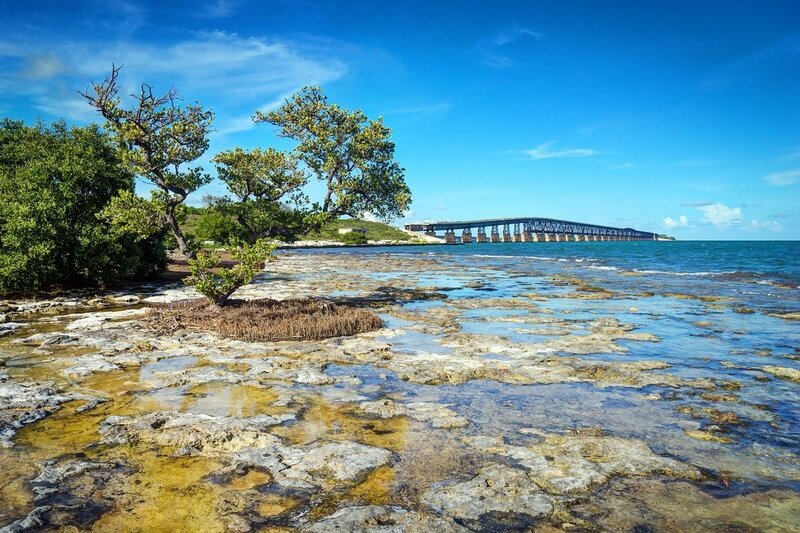 These days you drive across it on your way to Key West, or park just north of the bridge at Mile Marker 47 in Marathon and go walking or biking over to Pigeon Key along the older span. 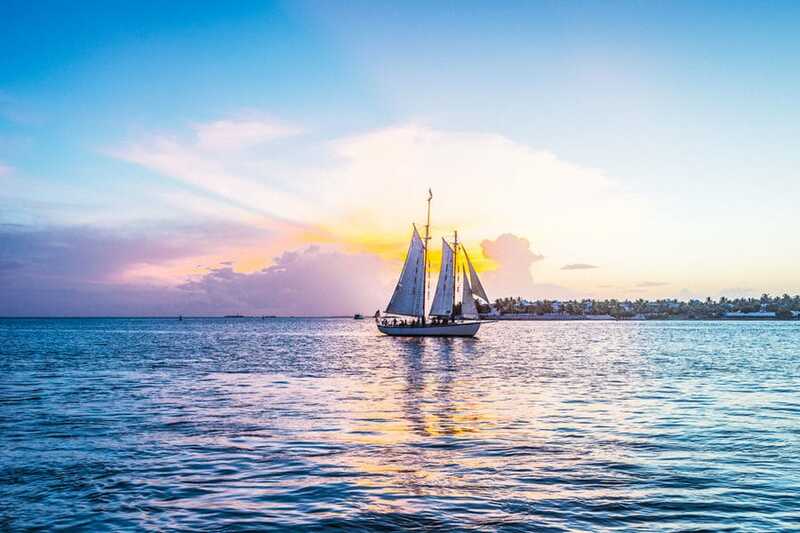 Gather a few friends and charter a boat for sailing lessons with Sunset Sail Key West like we did. Explore the islands powered only by the wind. They offer day trips, sunset sails, and overnight excursions. Dive into the ocean and swim with sea turtles, nurse sharks, parrot fish, and spiny lobsters on the shallow reefs around Key West. 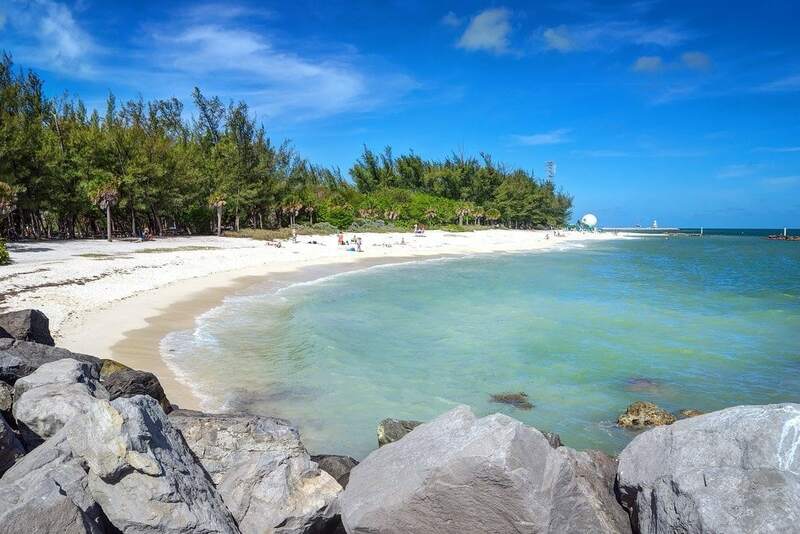 Join a boat tour or snorkel from the beach at Fort Zachary Taylor State Park. Ernest Hemingway lived in Key West during the 1920’s, and you can visit his old house, and make friends with the 50 or so six-toed cats that live there. The puuuurfect activity for crazy cat lovers (like me)! The sunsets in Key West are some of the best I’ve ever seen. 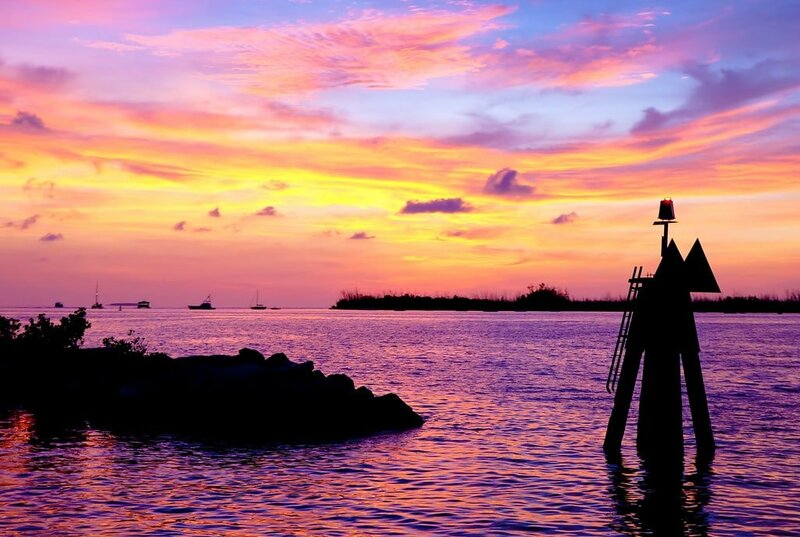 Grab a beer and watch in awe from Mallory Square as the sun drops below the Gulf of Mexico, painting the sky in brilliant shades of pink, purple, yellow, and orange. 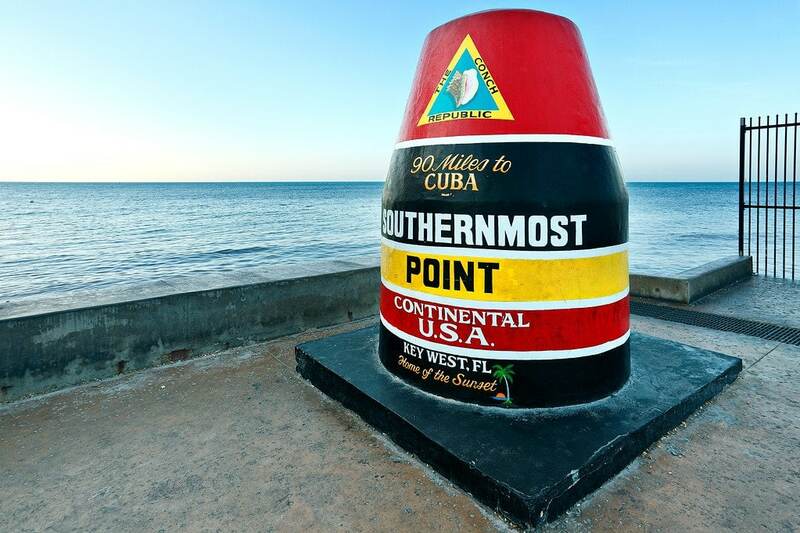 You can’t visit Key West and not stop by the southernmost point in the continental United States, which is marked by a red & white concrete pillar. The line for photos is long unless you get there early in the morning! Duval Street may only be a mile long, but it’s packed with small bars & old Victorian mansions. Pop in and listen to one of the many live bands playing Jazz, Cuban, or Salsa music. Don’t miss the Green Parrot Bar or the (clothing optional) Garden of Eden! For more activities and organized tours in Key West check Viator here. My suggestions for places to stay during your road trip from Miami to Key West. 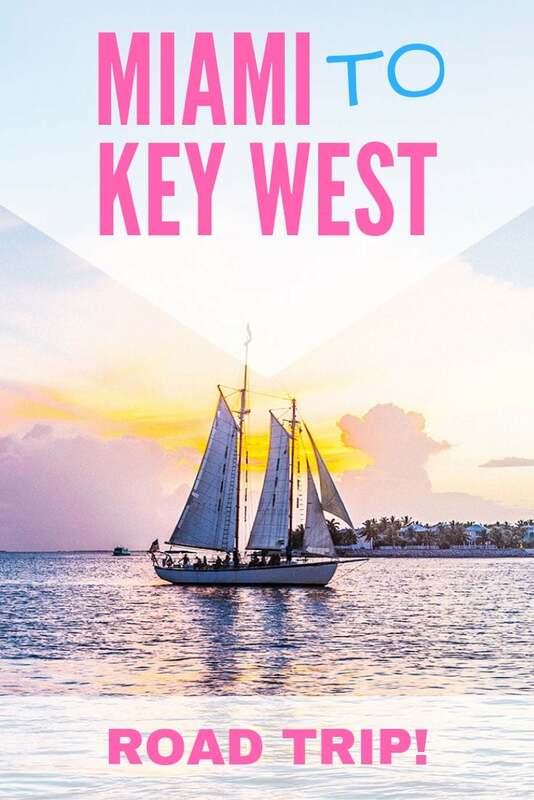 There aren’t many budget-friendly places to stay in Key West, and if you’re visiting during high-season, you really need to book a few months in advance! It’s not a big place. One of the best meals I ate in Key West was at Bagatelle Restaurant, located in a beautiful old building on Duval. 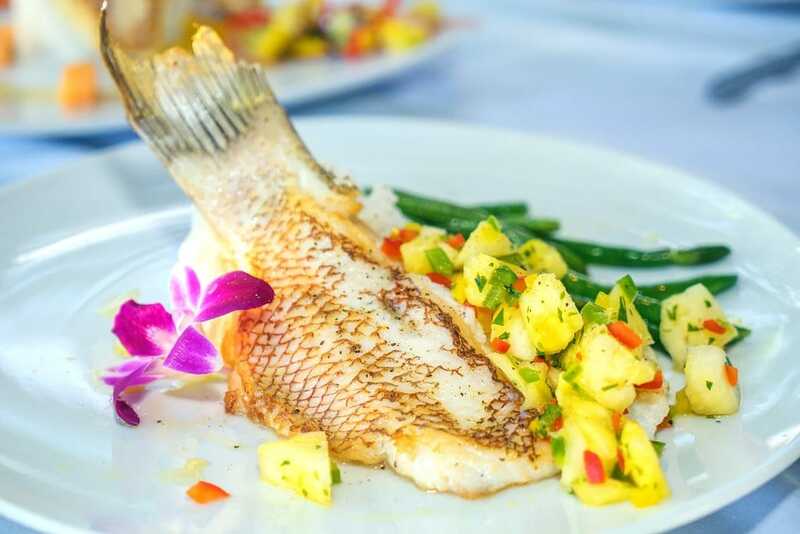 Locally caught Hogfish with jasmine rice and pineapple salsa. Yum! The key lime pie was born in Key West during the early 20th century. It’s made using the small key limes native to the area, more flavorful than regular limes. The Key Lime Pie Company makes a good one! The drive from Miami to Key West takes about 4 hours without stopping, however, with all the fun stops, expect a full day. Winter is a great time to visit Key West, but it’s also the busiest due to high-season. Instead, the shoulder seasons of March – May is less packed, hotel rates become reasonable, and the weather is similar. Have any questions about Key West? What about other suggestions? Drop me a message in the comments below! we will by in Miami for few days in November, this is great tip for a trip. If we will go to Key West by car, we have to pay some fees for bridges… or all road is for free? Oh, Miami is summer of summer and rest. Every day I dream of a trip to this country! What is the winter high season? It just means that in the winter, Key West is very busy as everyone up North escapes the snow to soak up some sunshine. But it’s also because the weather is the nicest that time of year. Awesome read and photograpy! I have been going to Miami forever but am yet to visit the Keys, hopefully soon!! For years this type of trip was on my bucket list. Now this year, the week of T-giving, my wife and I with another couple are going to make this trip. Us 4 are seniors enjoying life and plan to make this trip a memorable one. Thanks for the tips! Roadtripping through the Keys this summer and cannot wait to check out some of the places you mentioned. Awesome article! I’ve been to Key West a couple of years ago and I we just went there by bus straight from Miami without stopping. Definitely have to go back one day, now that I know what I missed out on! This post makes me want to hop in the truck and just head down there. I live in central Ga, so it is definitely a good drive, but not impossible! I wonder how difficult it would be to drive out there and sleep in the truck (or hammock) would be? Howdy Neighbor! Warner Robins here. We’re planning this trip for 2018. Driving all the way towing our teardrop camper. Can’t wait! Addition to the list: rent mopeds. EXCELLENT way to see the island. Make a random right turn and get lost, so much fun. Looks like you have an absolute blast wherever you go. It’s surprising you even have time to write about your adventures! Do you often hook up with other travel blog writers and how much do you compare notes when you do? Nice photography too. You have an eye for a great picture and you really capture the atmosphere of the places you visit. Helps to make your blog really come alive. I’ll travel with friends from time to time as long as we can make it work with our schedules, or we happen to be in the same area. Glad you’re enjoying the photography! If my Wife and I were to replicate your trip (jeep rental, boating, hotels, etc.) this summer, approximately how much should we expect to spend? Been to Key West several times. I want no plans hang in cool place by the water and stay in nice clean Hotel nothing extravagant where you can wear shorts and flip flops all the time. just be a total bum all week. Any suggestions from the locals on this page or anyone knows exactly what im talking about. Does he actually answer your questions? Have you heard summer land? Great article. I love the pics and suggestions. Now I need to plan my trip to Florida. Key West Beautiful island city. I never visited there but I read your blog and then search for it, I really want to visit there on my next vacations. I visited Miami with my friends for my summer holidays. I enjoyed the trip. When we were in miami someone told me to visit Key West but we didn’t go there, but now I think We should not skip to visiting Key West. Next Time I will definitely go there for Summer vacations. Thank you Matthew for a great blog post!! Love when I just get in handed in my hands like this. Easy and good! Know I now actually what do and not miss when I´m having a road trip down there next week. Where was your best dive? Should we book in advance, any recommendations? My favorite thing about the Keys are the presence of manatees! Love at first sight. They are endangered, so definitely check them out. Their closest living relative is the elephant. Totally bizarre animals. Love the manatees too! Such interesting, gentle giants of the sea. I love your sunset shots especially the last one! I know what where to go now in the next summer! Also, the six-toed cats! Whoa…sharkie is grooving to the tunes too! lol. Good post. I think you have synergized the brand ambassadorship with your roots quite well. Still engaging and informative, but putting rice on the table too. Enjoying a mojito at the Afterdeck Bar at Louie’s Backyard is one of my favorite things to do in Key West. Next time, book an overnight stay at Hawk’s Cay on Duck Key. Great resort with a saltwater lagoon, multiple pools and a dolphin experience! 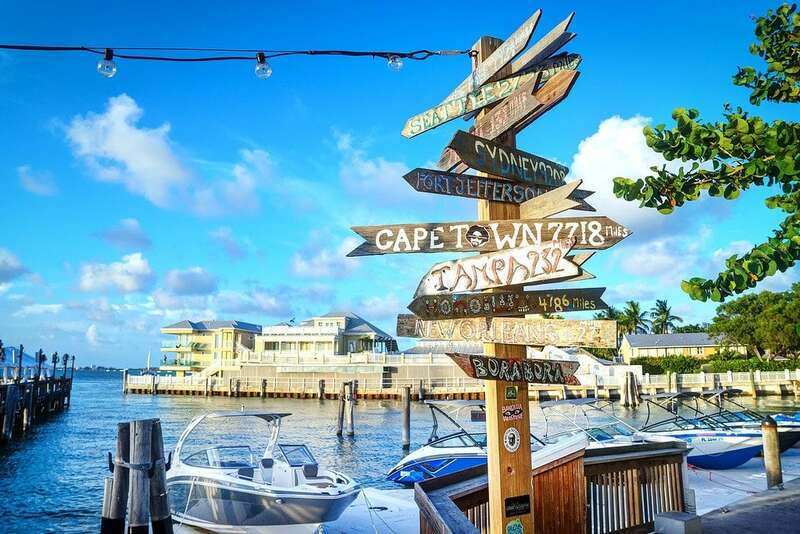 Key West High School graduate here…next time you are down get a Famous Key Lime Freeze from Mrs. Mac’s in Key Largo and try lunch or dinner on the water at Keys Fisheries Market and Marina on Marathon. Oooooo. Key lime freeze? That sounds tasty. Thanks for the tips Amanda! The whole time I was reading this I was thinking about the Keys Fisheries and that I should recommend it for lunch or dinner. You beat me to it. The lobster bites are my favorite. Next time you’re down this way, we hope you’ll stop by our new facility in Marathon! We’re coming up on our 1 year anniversary, and have tons of cool marine life to share with visitors. Whether you want to just take a quick look around, or wiggle into a wetsuit and jump in one of our tanks to feed our animals, there’s something for everyone! Cool! I didn’t know you could jump in the tanks with them. Matthew, i was thinking of heading to Key West for my Birthday in December and was planning on going via sea. This post knock that option out of the park!! This look so much more interesting…your pictures along with Steph and Lauren on IG having me wishing December would just get here! It’s a fun little road trip Leethan. The first part of Route 1 is pretty bland with not much to see, but as soon as you get to the Keys there’s all kinds of interesting places to stop. Thanks for the heads up Matthew, will tag you on Instagram when i visit. We have been in Florida for some time now but we still haven’t made it down to the Keys. Hope we get a chance to go before we leave for SEA. Hey Ben! If you’re short on time, all it takes is a weekend. Drive down early in the morning, spend 2 nights, drive back in the evening. Just to get a taste. Looks like a great time! That tarpon is a beast. I’d be keen to go sailing there. I’ve only done small boat sailing where you steer with a tiller. The one you rented looks a lot more comfortable and less likely to capsize. One of our captains flipped a smaller boat the day before when a low-flying Blackhawk helicopter from the Navy base nearby flew too close. Not fun! Jealous of your upcoming sailing trip Ron! I’m sure you’ll have a blast. I’m glad you enjoyed your trip to our Great and Wonderful Florida Keys. I just wanted to point out, that the reef’s are around 7 miles out from Key West. So snorkeling off the beach you do not get anywhere close to the same effect as taking a boat out to the reef’s. Enjoy your travels and come again soon.Thanks for Visiting us. Good point. Yes, the better snorkeling is out on the reef, which requires a boat ride. I went to Florida just once and all I’ve seen was Orlando (which I loved…so much fun) and Miami! I’ve heard quite a lot about Key West. Learning how to sail would definitely be something I would love to do. Love the site, happy travels. You have me totally missing living in Florida right now! I used to sneak down to Key West all the time when I lived in Miami. Schooner Wharf Bar is still one of my favorite bars anywhere! Loved that bar! Such a fun spot. Your sunset photo is breathtaking! The sunsets in Key West are spectacular.